Ruby black color. Complex, interesting aromas and flavors of fresh cracked black pepper, dried fruits and figs in a cedar crate, pomegranate vinaigrette and cajeta, and meats and tobacco dehydrating in a brick oven with a satiny, vibrant, fruity medium-to-full body and a tingling, layered, long honeyed craisins, chocolate custard and nuts, candied oranges, and peppery spice finish with fine, dusty tannins and light oak. 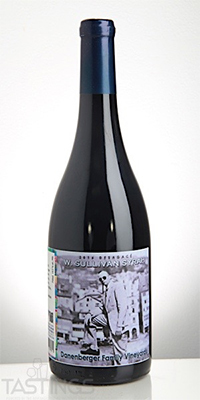 A tantalizingly savory, spicy, meaty and complex syrah to compliment an adventurous meal. Lamb, beef, cured meats, smoky bleu cheese, Camembert.